There once was a horse named Fashion who lived in Massachusetts with a girl named Loretta. Loretta loved to ride horses. Her favorite was Fashion. She was ten years old and lived in a house with her mom and dad. She fed her horses--Pepper, Fashion, Banana, and Bubble everyday. She did not go to a school but went to a horse school to ride horses. She had friends at horse school. Loretta rode Fashion, Anna rode Pepper, Emma rode Tinsel, Grace rode Jellybean, and Gabby rode Felix. 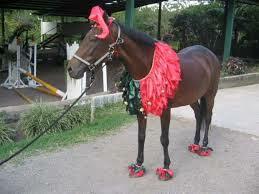 Some days, Loretta made clothes for Fashion that were fancy for horses. One day, Fashion was in a big horse show to look the prettiest. But there was a big mistake at the horse show because two of them were wearing the same outfit! The only two horses that came were wearing the same thing! Then there was another horse show that all the horses came to in the barn. Bubble, Banana, Fashion, and Jelly Bean were at the horse show. First place was Fashion, second place was Jelly Bean, third place was Banana, and Bubble came in last place. Loretta and Fashion were in the newspaper together! I didn't understand this story. The pictures go great with the story! I love it! I like this story. It is really cute!